For doctors who specialize in natural medicine, hypertension isn’t just a simple disease of high blood pressure readings, and treating it isn’t simply a matter of lowering the numbers using high blood pressure remedies, says Dr. Mark Houston, MD, a well-known integrative hypertension specialist. Hypertension is a slowly progressing cardiovascular “syndrome”—as opposed to a disease—and it arises from complex and interrelated high blood pressure causes, he notes. High sensitivity C reactive protein (hsCRP): This can be measured with a simple blood test and is the best marker to detect blood vessel inflammation. This important biomarker predicts cardiovascular disease and the risk of death from any cause. It is part of a vicious cycle that links inflammation with high blood pressure. Even small increases in hsCRP are reflective of increased endothelial inflammation which increases blood pressure readings over time. Fortunately, there are many natural high blood pressure remedies as well as nutritional and lifestyle therapies that have been proven to lower hsCRP. For instance, fish oil, anti-inflammatory foods, potent polyphenols like pycnogenol (pine bark extract), and even moderate exercise and stress reduction techniques can lower hsCRP. EndoPAT™ test: This test helps to identify problems with the arteries that may occur before blood pressure readings become elevated. The EndoPAT™ test identifies endothelial dysfunction. The endothelium can become dysfunctional even with normal blood pressure readings of around 120/80. It is a 15-minute non-invasive test performed in the doctor’s office that uses fingertip sensors before and after a blood pressure cuff temporarily stops blood flow through the brachial artery of the arm. 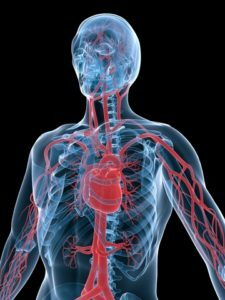 Certain natural high blood pressure remedies as well as diet and lifestyle therapies have been found to successfully treat endothelial dysfunction. 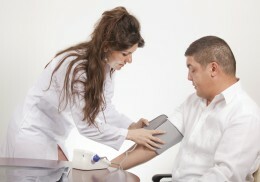 Treatment for the hypertension syndrome, according to Dr. Houston, should always start with non-drug therapies first. He stresses that exercise, weight reduction, smoking cessation, restrictions in the use of sodium, alcohol, and caffeine, and other lifestyle changes must be incorporated to maximize healing and fend off heart disease and stroke. In terms of natural high blood pressure remedies and supplements, Dr. Houston describes how the scientific evidence for the use of certain nutraceuticals, vitamins, antioxidants, and minerals in the treatment of hypertension is substantial and growing rapidly. Most importantly, says Dr. Houston, the hypertension syndrome is a sign of what is known as endothelial dysfunction. The endothelium is a single layer of cells that lines the inner walls of the arteries. It performs many functions that help control blood pressure, such as regulating blood vessel constriction, inflammation, anti-oxidant activity, and the ability of plaque to form within the arteries. A myriad of influences can disturb this balance, according to Dr. Houston, including many vitamin and mineral deficiencies, genetics, inflammation from any source, and oxidative stress. If you would like to heal your damaged arteries AND have lower blood pressure readings, consider increasing your intake of any of the foods, antioxidants, and other high blood pressure remedies listed above. alcohol, alpha lipoic acid, amino acids, anti inflammatory, anti inflammatory foods, antioxidants, blood pressure, blood pressure readings, blood pressure remedies, blood sugar, c reactive protein, caffeine, calcium, cardiovascular, cardiovascular disease, carnitine, cholesterol, control blood pressure, diet, endothelial dysfunction, exercise, exercise and stress, fish oil, for high blood pressure, garlic, heart disease, high blood pressure, high blood pressure and, high blood pressure readings, high blood pressure remedies, high cholesterol, hypertension, inflammation, insulin, integrative, kidney function, lower blood pressure, magnesium, metabolism, n acetyl cysteine, natural high blood pressure, natural high blood pressure remedies, natural medicine, natural remedies, natural remedies for, natural remedies for high blood pressure, normal blood pressure readings, obesity, omega 3s, oxidative stress, plaque formation, polyphenols, pomegranate, potassium, protein, pycnogenol, recipe, remedies for high blood pressure, resveratrol, smoking, stress, stress reduction, stress reduction techniques, stroke, sugar, supplements, tocotrienols, vitamin, vitamin c, vitamin e, vitamins, vitamins and minerals, zinc. Thanks Dr. Jade for recommending the High sensitivity C reactive protein blood test as an important test to ask your doctor to run every year. It is inexpensive, and it is an effective early warning sign of blood vessels that are inflamed and not in good shape. I have my doctor run it each year and try to keep it under 1.0 mg/L. I am not familiar though with the EndoPAT™ test. Has anyone else used this test?